On a cold Monday night in November of 1987, the Chicago Bears traveled to Denver to face off with the Denver Broncos in a game that featured two teams that had appeared in the previous two Super Bowls. Entering the game with the league’s best record at 7-1, the Bears seemed poised for a second Super Bowl title in three seasons. Chicago was still under the leadership of head coach Mike Ditka, but finally had a healthy Jim McMahon at quarterback and running back Walter Payton, who had announced he would retire at the end of the season. While the Bears were establishing themselves as a Super Bowl favorite, the Broncos were having tough time defending their AFC championship as they entered the Monday night showdown with Chicago with a 4-3-1 record and in third place in the AFC West. Despite their inconsistency, the Broncos still felt confident about their chances of a second straight Super Bowl as they still had quarterback John Elway at the helm. But if the Broncos were to make that second straight trip to the Super Bowl, they could not afford to lose against the Bears. The Bears got the ball to start the game and drove from their 10-yard-line to the 49-yard-line, where they faced a 3rd-and-2. That is where McMahon faked a handoff to Payton, and fired a pass to Willie Gault, who made the catch at the Denver 40-yard-line, made a spin move, and outraced several Bronco defenders for a 51-yard touchdown that put Chicago ahead 7-0 just over three minutes into the game. After forcing the Broncos to punt on their opening possession, the Bears got the ball back at their 14-yard-line where it took them eight plays to get back into the end zone, a 6-yard pass from McMahon to tight end Cap Boso to increase the Bears lead to 14-0 with 5:26 left in the opening period. Following the Bears’ second touchdown, Elway finally got the Denver offense on track as he led them on an eight-play, 84-yard drive, culminating with a bizarre touchdown that brought the Broncos back into the game. From the Bears’ 22-yard-line, Elway rolled out to the right and fired a pass intended for Steve Sewell, who was in front of the goal line. However, the ball was tipped by Bears safety Todd Bell, only to be caught by Vance Johnson for the touchdown to make it 14-7 early in the second quarter. The Bears responded to the touchdown with another long drive, as McMahon completed six of nine passes on a drive that covered 89 yards from the Chicago 10-yard-line to the Broncos’ one-yard line where Chicago faced a third-and-goal. 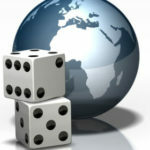 For the third-and-one, Ditka sent in defensive tackle William “The Refrigerator” Perry, who ran in for two touchdowns during his rookie season in 1985, including one in the Super Bowl. This time, Perry was sent in as a blocker, but McMahon called an audible on the line of scrimmage, and handed the ball off to “The Fridge”, who had not carried the ball all season, only to have Perry be stripped of the ball by defensive back Mike Harden, short of the goal line. Cornerback Mark Haynes picked up the loose ball and returned it 23 yards before he was knocked out of bounds by Payton at the Denver 24-yard-line to end the Bears’ scoring threat. The Broncos made the Bears pay for their fumble at the goal line as they drove 76 yards in 10 plays, with Elway scrambling twice for first downs, and then firing his second touchdown pass, a 22-yarder to Mark Jackson that along with Rich Karlis’ extra point tied the game at 14, with under two minutes to go before halftime. The Broncos forced a three-and-out on the Bears’ ensuing possession to get the ball back at their 31-yard-line with a chance for more points and take their first lead of the game. 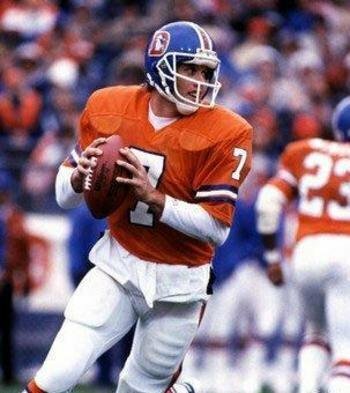 With 1:05 left on the clock, it took Elway and the Broncos seven plays to get back into the end zone as Elway connected with rookie wide receiver Ricky Nattiel for a 35-yard touchdown that put Denver on top 21-14 as the first half came to a close. Jim McMahon threw for over 300 yards for the first time in his career in a Monday night loss to the Broncos. The Broncos could not carry the momentum of the second quarter into their opening drive of the second half as they were forced to punt the ball back to Chicago, who took over at its own 28-yard-line. After allowing 21 straight points, the Bears got back on the scoreboard as they drove 72 yards in seven plays, ending with a 26-yard touchdown pass from McMahon to Gault that put Chicago to within one point of tying the game. But kicker Kevin Butler would miss the extra point and the Bears remained behind, 21-20 with 8:10 left in the third quarter. However on the Broncos’ first play from scrimmage after the touchdown, Elway was intercepted by linebacker Ron Rivera, who returned the pick to the Denver 15-yard-line, leading to a one-yard touchdown run by McMahon that put the Bears back in the lead. But for the second straight time, the Bears would miss the extra point as long snapper Tom Thayer snapped the ball too low for holder Mike Tomczak, who proceeded to try to run it in into the end zone until he lateraled the ball back to Butler. Butler was shoved out of bounds short of the goal line to keep the Bears’ lead at five points, instead of seven points, meaning the Broncos would only need a touchdown to retake the lead. However, Chicago increased the lead to eight points as Butler nailed a 42-yard field goal for a 29-21 lead with 1:30 to go in the third quarter. If the Broncos were to win the game and keep their playoff hopes alive, they would need Elway to lead Denver to its 15th come-from-behind victory since he became the Broncos’ quarterback in 1983. The Denver comeback got off to a good start with a 27-yard field goal by Karils that cut the Bears’ lead to five points at 29-24 with plenty of time left on the clock, 12:20 to go in the fourth quarter. 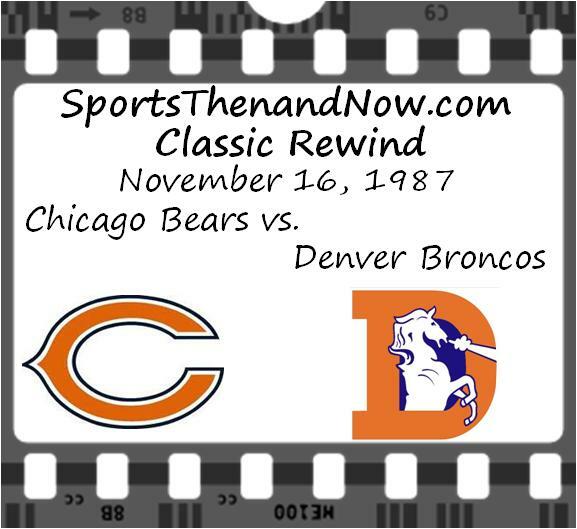 Following Karlis’ field goal, the Bears drove from their 35-yard-line to the Denver 31-yard-line when the Broncos defense rose up and forced their second turnover of the game. Rookie cornerback Kevin Clark picked off a poorly thrown McMahon pass and returned it 20 yards to give the ball back to the Broncos at their 39-yard-line with 8:43 left before the end of the fourth quarter. Eight plays later, Sewell was in the end zone with a four-yard touchdown to put Denver back on top, 31-29 with 4:58 left to play. Now, the two missed extra points by Butler were coming back to haunt the Bears as they now trailed by two points instead of having the game tied at 31. John Elway led another 4th quarter comeback for the Broncos as they defeated the Bears on a Monday night. The Bears needed to put together a drive that would result a field goal and take off as much time off the clock, thus not allowing Elway enough time to counter. But on a 3rd-and-11 from the Bears’ 39-yard-line, McMahon was sacked by Broncos linebacker Karl Mecklenburg, forcing Ditka to punt the ball back to Denver and hope his defense would allow a 1st down. The sack not only stopped the Bears’ efforts for a last-minute field goal, but got McMahon hurt as he twisted his left ankle and limped off the field following the 3rd down play. The Broncos got the ball at their 13-yard-line and were unable to gain a 1st down, but used more than a minute off the clock before they punted the ball back to the Bears, who take over at their 46-yard-line with 45 seconds to go and no timeouts remaining. But after an incomplete pass on 1st down, McMahon was sacked again, this time by nose tackle Andre Townsend for a seven-yard loss and knocking McMahon out of the game. Tomczak came in for McMahon but could only complete two screen passes to running back Neal Anderson before the clock ran out as the Broncos would come away with a 31-29 victory. The comeback win was the spark the Broncos needed as they would go on to win five of their last six games of the regular season for a 10-4-1 record, which earned them home field advantage throughout the AFC Playoffs. Denver would defeat the Houston Oilers 34-10 in the Divisional Round, and then knocked off the Cleveland Browns 38-33 in the AFC Championship Game to advance to their second straight Super Bowl, where they were blown out by the Washington Redskins 42-10 for what would be the second of three Super Bowl losses for the Broncos in the late ‘80s. As for the Bears, they would finish the regular season with an 11-4 record which earned them their fourth straight NFC Central Division title. But the Bears would be eliminated for the second straight year by the Washington Redskins in the Divisional Playoffs by the score of 21-17 in the final game of Payton’s storied career. 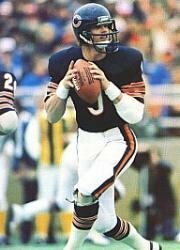 The following season, McMahon would split time with Tomczak in the starter role as the Bears won their fifth straight NFC Central Division title and advanced to the NFC Championship Game, where they fell to the San Francisco 49ers. Following the 1988 season, McMahon would be traded to the San Diego Chargers, where he spent one season before playing for four more teams until his retirement in 1996.